In typical usage, XBRL comprises of a XBRL instance, containing primarily the business facts being reported, and a gathering of taxonomies (called a Discoverable Taxonomy Set (DTS)), which characterize metadata about these facts, for example, what the facts mean and how they relate to each other. XBRL uses XML Schema, XLink, and XPointer standards. Things are facts holding a solitary value. They are spoken to by a solitary XML component with the value as its substance. Tuples are facts holding numerous values. They are spoken to by a solitary XML component containing settled Items or Tuples. In the outline of XBRL instance documents , all Item facts must be assigned a setting. Connections characterize the element, e.g., company or individual, to which the fact applies, the timeframe the fact is relevant, and an optional scenario. Date and time information appearing in the period component must conform to ISO 8601. Scenarios give further contextual information about the facts, for example, whether the business values reported are actual, anticipated, or planned. Units characterize the units utilized by numeric or fractional facts inside the report, for example, USD, shares. XBRL allows more unpredictable units to be characterized if necessary. Facts of a monetary nature must utilize a unit from the ISO 4217 namespace. Commentaries use XLink to associate one or more facts with some substance. 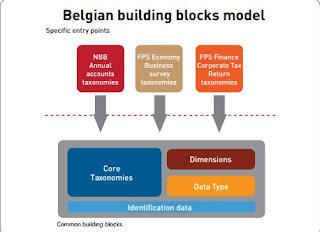 References to XBRL structure taxonomies and typically through schema references. It is also conceivable linkbases to interface straightforwardly to a linkbase.